You may also be interested in our quadratic equations solver. You can find it for free at our quadratic formula page, or a larger version here. Once your read our explanation, you will have no problem solving the equation at the right. A quadratic equation has a term with x2 in it. See the examples below. Now that we have that out of the way, let's solve. Need more information about factoring? Factoring & Factoring Polynomials. Once you have factored the polynomial, you will use the zero product property - basically you will set each factor = 0. 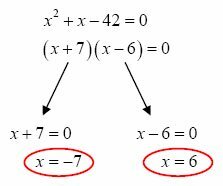 To solve by factoring, you will first need to set the quadratic equal to 0. Then, you will factor the equation. For more information, click the links above. After the equation is factored, set each individual factor equal to 0. Then solve the simple equations. Your final answers are x = 6, -7. 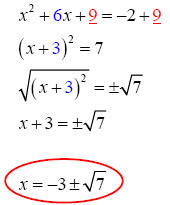 Make sure to get your quadratic into standard form (see above), and then plug the values into the quadratic formula. Details of how to use the quadratic formula. Completing the square is the process of creating a perfect square trinomial. To do this, you will add an equal amount to both sides of the equation. The amount that you add is determined by the b value. First, convert the equation to the following form: ax2 + bx = c.
Next, you will add (b/2)2 to both sides of the equation. Finally, you will factore, take the square root of both sides, and then simplify the equation. Take a look at the example and step by step instructions below of how to solve quadratic equations by completing the square. Congratulations, you just learned three different methods of how to solve quadratic equations. Return to more free algebra help or visit the GradeA homepage for more free math help.